In mSupply-HIS an encounter is a record of an interaction between a patient and a hospital service. In this first version, the only type of encounter handled is an inpatient admission, but we will be able to use “encounter” to allow for outpatient consultations and interactions with laboratory, x-ray and other services in the future. Choose Patient > New encounter, or click the New Encounter button on the navigator. Enter as much of the patient surname (and a comma, then the first name if you want to) then press <tab> to show a list of matching entries. You can enter an expected discharge date (defaults to the next day), and where the patient was referred from and how they arrived at the hospital. 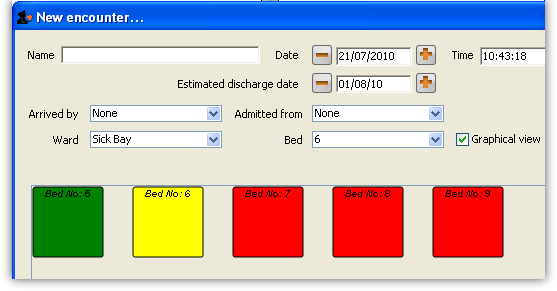 Once you choose a ward, a list of available beds is shown. 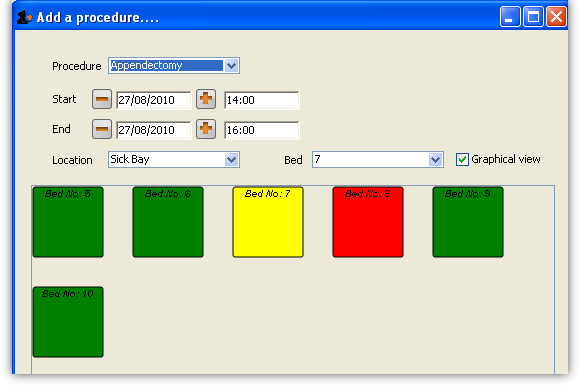 If you choose to show the graphical view, you can see each bed, and you can click on a bed to assign the patient to that bed. Available beds are shown in green, and beds that are occupied are shown in red (or if you are using the drop-down list, only beds that are available are shown). The selected bed is shown in yellow. The admission date defaults to the current date and time, but you can change these and the available beds will be updated accordingly. Once you have chosen a bed, click OK or OK & Next. Choose Patient > Manage encounters, or click the Show Encounters button on the navigator. The window has a side bar where you can show currently admitted patients or historical records. By default, it shows encounters for currently admitted patients who have been admitted in the last 30 days. Clicking the Find entry in the side bar allows you to search for specific records. In the tool bar there is a New Encounter button, allowing you to add an encounter directly from there. If you double-click an encounter you are shown the encounter details. The first tab lists the location(s) (i.e. the beds/wards occupied) during this encounter, and the fourth tab shows log records related to the encounter. Once a patient has been discharged, their encounter data can now longer be edited. 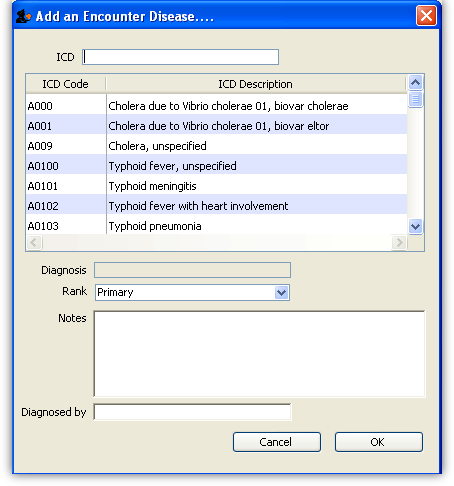 The cursor will be in the ICD field, and you can type as much of the code or name as you know to find matching records. Double-click the record you wish to use in the list. Choose from primary/secondary/tertiary for disease rank. Enter any notes you wish to record. You can enter the name of a clinician who diagnosed the condition if you want to. To do so, enter the start of the name and press <tab>… a list of matching clinicians is shown. Double-click on the clinician you wish to choose. If you want to add a new clinician, click the New button. A window to enter the clinician’s details is shown (see Prescribers). Enter details and click OK.
Once you have entered the disease details, click OK to close the list of diseases for the current encounter. You can now click the Add encounter disease button again to add another disease, or double-click an entry to edit it. As for encounter locations (see Encounters), you can specify a “bed” location (e.g. in a “ward” designated as an operating theatre) which is free for the specified time slot, and this can be viewed graphically. The list of procedures is generated from those previously entered via Procedures. From the procedure list, you can also double-click on an existing procedure record to view/edit it. The date/time defaults to the current date and time. The last name defaults to that of the mother. You can enter the birth weight (kg) and length (cm). You can specify if it is part of a multiple birth, and whether the birth was normal, premature, or stillborn. When the record is saved, a new patient record will be created for the baby, with its next of kin set to its mother. 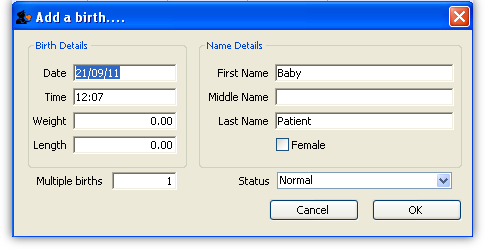 You can then add a separate encounter record for the baby if needed. You can also double-click on an existing birth record in the list to view/edit it.